travelledon - We provide guidance on how to learn Italian the easy way ... immersion in the language and culture. ...... though studying does seem to help! What follows is a chronicle of my attempts to come to grips with the language, along with many diversions and excursions to soak up the art [with some difficulty], history [with great interest], culture [with much pleasure] and the wine [with little encouragement] and the cuisine [with great enthusiasm and gusto] of Italy. A little while ago came across this great article via the BBC website by Breena Kerr [22 June 2017] ... I just had to share it. I have had many 'highs' and many 'lows' ... the 'highs' come from finally understanding some words AND their context ... in equal or greater measures are the 'lows' that come from starting to realise just how much more there is still to understand ... the paradox being that the more you learn, the less you know because you become aware of how much more there is still to understand! Fortunately most Italians have a good understanding of English and they enthusiastically will help you out ... I always apologise for my very poor Italian and ask if they could please talk to me in Italian ... that is a great ice-breaker. I have not tried to teach Italian to anyone visiting this site. That is way beyond my abilities, though the odd word is provided here and there. What rather I am trying to do is introduce you to some of the steps in my as-yet-unfinished journey, to provide some pointers and to encourage you to take on some of the amazing challenges that lie ahead. As with so many things, it is only when you are truly immersed [even submerged] that you start to understand things. The three language schools I have attended in Italy take a similar approach - you are immersed! The small classes are conducted in Italian. There are no dictionaries or phrase books, no iPad or iPhones ... just the language. If the Italian word is unknown to you then you ask the question [in Italian, of course] as to its meaning, The teachers [insegnante] will provide synonyms [or antonyms] or put the word in context in another sentence, or even mime it ... the very last resort is to quickly, quietly, provide the English translation. Remember, there are students from all over the world so there is not really a common language other than Italian ... students in my various classes have been German, Japanese, Swiss, Austrian, Danish, Indonesian, Hungarian, American, Polish, Chinese, even some English speakers, with various Australian dialects thrown in. After two or so days you start to wonder, naturally, "What am I doing here?" ... after three or four days you start to reference the things you may have heard on day one or two and slowly, slowly things become a bit clearer. It is that dawn of understanding, that moment or flash, that makes it all so rewarding .... "a-a-h-h... so that's what that means". So 'convoy' means 'with you'. 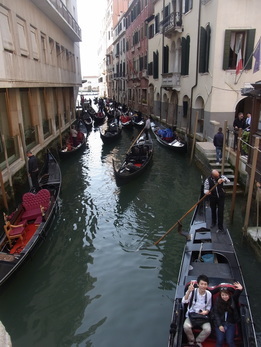 I was watching a procession of gondolas [gondole] passing and remarked on the convoy, or long queue, when ... this flash of light ... the person with me was quite taken aback when I suddenly grabbed him by the shoulders and loudly proclaimed, "so that's what it means!!!" The absolute clarity of that moment remains a highlight ... fortunately, not the only one! I have referenced the language schools I have attended in Sydney, Siena, Venezia and Montepulciano and have added some details of the side trips I've taken getting to Italy, being in Italy and / or getting home again. In addition, there are some other places I've included that I've visited at various times. Select the "Go and See' option or just click on this paragraph. I have no commercial arrangements or deals with any of the places mentioned, rather a wish to share with you the many, many instances of Italian warmth, hospitality and friendliness I have enjoyed. Go and immerse yourself and find these experiences for your enjoyment too! * With thanks to my forever friends and mentors Luciano Gaminara and Gianni Gagliano for starting me on this path ... and the wise Cosimo Brescia and so many others ... I just wish Pepe Centonze was around to see my progress!